Drawn to the remains of beached whales on Chukotka’s shores, more than 40 polar bears have scared residents of Ryrkaypy into staying inside. Wildlife experts are warning residents of villages on the Chukotka peninsula to stay in their houses after dark to avoid coming into contact with more than 40 polar bears feeding on whale remains on the shore. The bears have been roaming the shores of the peninsula for a week after they floated to land on melting ice and made their way up the shore in search of food. According to the World Wildlife Fund (WWF), observers usually encounter small groups of the animals during certain parts of the year. For example, the Marine Mammals Council expedition, which flew over the coast of Chukotka a few weeks before, spotted only 15 animals, which were at the time moving singly. On November 3, a group of 20 bears simultaneously appeared close to the village of Billings. “When I came out of my house in the morning, there was this bear just standing there. I looked at him, he looked back, and I went on my way. The next day I there was a polar bear again,” the WWF press office quoted a Bear Patrol observer in Chukotka as saying. Soon after those siting of polar bears, WWF observers in Billings village started sending messages of a more anxious nature. Observes now believe that an ice bridge formed between a large ice floe, where the bears had been spending the summer, and the coast. “The animals’ historical memory reminded them that there is food on the other side, so that’s where they went,” Bear Patrol project manager Viktor Nikiforov explained. “Indeed, there were remains of 15 beached gray whales there on the shore, from Kolyma to the Barents Strait. It’s bad news for the whales, but not for the bears – they get food,” Nikiforov said. Having had their fill of the whale meat near Billings, the polar bears, now numbering around 30, headed southeast. During the course of a couple of days, the bears had covered 200 kilometers (124 miles) along the coast, reaching the village of Ryrkaypy on November 6. Ryrkaypy is situated right on the coast, so, sooner or later, the pack of bears could invade its territory, observes said. However, the locals got lucky: the remains of two dead whales and a few dead walruses were on the shore just a few kilometers ahead. This finding slowed the bears down, but at the same time, it served to attract further animals to feed on the remains. By November 7 evening the Bear Patrol observers, led by Tatyana Minenko, counted 43 bears on the shore. Minenko reported to Moscow that the animals had begun to appear on the outskirts of the village. She was concerned that the bears could reach the village dump, located immediately next to residential premises. Patrols have been touring the village outskirts several times a day, examining bear tracks in the snow. Working together with the local administration and managers of businesses, the patrols informed locals that shooting polar bears is prohibited and explaining how to behave if faced with a polar bear. “There are always those who want to go out and watch the bears, especially school kids,” Nikiforov said. “Our patrollers Valery Kayarakhtyn and Maxim Deminov are on guard near the school area from the morning, and twice a day they tour the village, controlling the situation,” Minenko reported. Ecologists cautioned that it would be impossible to hold off such a number of bears for any considerable length of time. But the weather played into the hands of the Chukotka residents. On November 8, a southerly wind broke ice floes from the shore, taking with it a number of the bears. 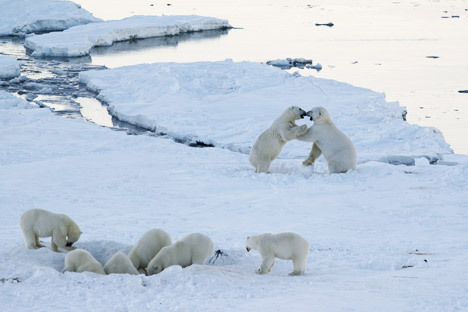 However, a number of the polar bears remain near the whales, Nikiforov said. Now the village of Ryrkaypy is under curfew, and the locals are prohibited from leaving their houses at night. According to the WWF, such a gathering of polar bears in one place in Chukotka is quite unique. The last time a large number of polar bears came ashore was in 2006. “But this has nothing to do with there being more polar bears than before. There are only 25,000 of them left in the Arctic. It is simply because of the freeze-up,” explained Nikiforov, adding that he hope the bears would soon move away from the village, and the state of siege would be lifted.